“In all this you greatly rejoice, though now for a little while you may have had to suffer grief in all kinds of trials. These have come so that the proven genuineness of your faith—of greater worth than gold, which perishes even though refined by fire—may result in praise, glory and honor when Jesus Christ is revealed” (1 Peter 1:6-7). It’s easy to blame God when life goes wrong. He can do anything. Stop anything. Change anything. But sometimes He doesn’t. People have free will. The world is full of death and disease and sin. Bad things happen to good people—even good Christian people. He said I should give thanks. “Rejoice always, pray continually, give thanks in all circumstances; for this is God’s will for you in Christ Jesus” (1 Thessalonians 5:16-18, NIV). He said He understands my challenges. “For we do not have a high priest who is unable to empathize with our weaknesses, but we have one who has been tempted in every way, just as we are—yet he did not sin” (Hebrews 4:16). He said I wouldn’t be crushed. “We are hard pressed on every side, but not crushed; perplexed, but not in despair; persecuted, but not abandoned; struck down, but not destroyed” (2 Corinthians 4:8-9). He said I’d never be alone. “You know when I sit and when I rise; you perceive my thoughts from afar… You discern my going out and my lying down; you are familiar with all my ways…You hem me in behind and before, and you lay your hand upon me… Where can I go from your Spirit? Where can I flee from your presence? If I go up to the heavens, you are there; if I make my bed in the depths, you are there” (Psalm 139: 2,3,5,7,8). When I look at these verses, I remember true peace always finds me when I give thanks in the worst of situations. I remember that I’m still here, still living, not destroyed, even when people and situations have tried to break me. I remember the times He walked me through the darkness of feeling alone and abandoned. As my perspective changes, so does my disappointment. God’s purpose isn’t to wrap me in that bubble and keep me away from the harsh realities of the world, it’s to walk with me through them. His purpose is to refine my faith. If you’re hurting and you feel like God has let you down, don’t lose faith just yet. Not before you take an honest look at your disappointment. 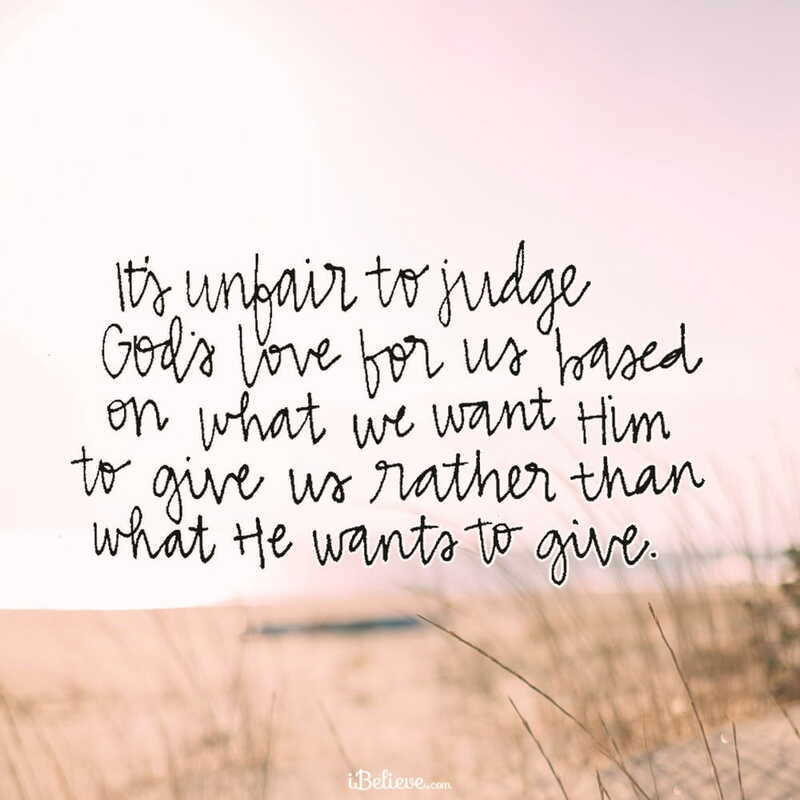 Just like it would be unfair of me to blame my boss for not giving me a promotion he never offered, it’s unfair to judge God’s love for us based on what we want Him to give us rather than what He wants to give. Lord, Your ways aren’t our ways. It sounds so simple. I’ve memorized the verse. But help those words sink in. Show me Your perspective through Your eyes. Help me to see that while I’m a small part of the bigger picture You have planned, you love me and I’m part of Your purpose. Rather than blame You when things go wrong, help me to remember You’re the only one who’s right there beside me as I crawl through the fire. In Jesus’ Name, Amen. Editor’s Note: Content taken from “How to See God’s Purpose in Your Disappointment” by Lori Freeland. You can read that piece in full here. All rights reserved.